Commercial hummus dip is available almost everywhere, however as we all know, nothing compares to homemade! That’s why I’ve put together a collection of my top three, super easy hummus recipes for you to prepare this delicious dip in less than 10 minutes! And the best part? It tastes even better that the one you can buy in store and if you are being frugal, save quite a bit of money in the process too! As you are not restricted to the ingredients used by major food chains for your own homemade hummus you can tinker around with the seasonings, garlic, lemon and tahini to adjust its flavor to your liking. And I can promise you one thing. After you try these homemade hummus recipes, you will never go for the store version again! 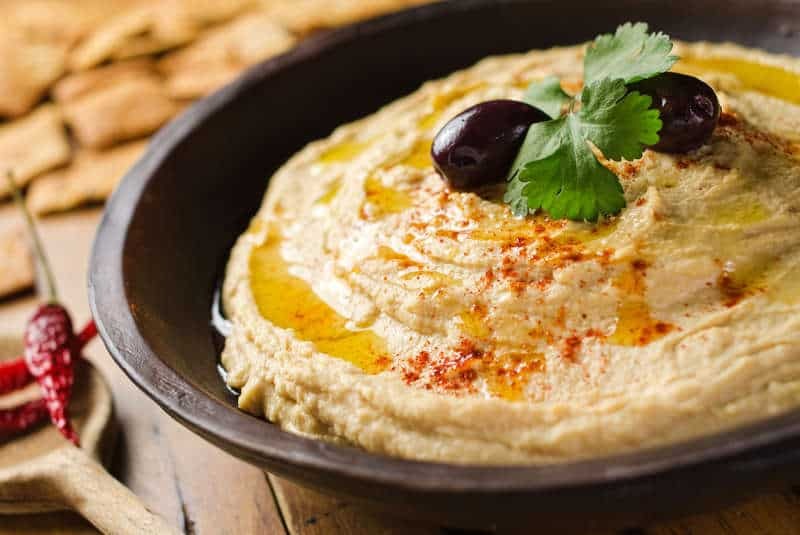 The traditional Hummus originates from the Middle East and its made from cooked then mashed or pureed chickpeas blended with tahini, lemon juice, olive oil and flavored with garlic and spices like cumin or paprika. A lot of speculation abounds for the origin of the authentic hummus recipe, which in some cases it is claimed to be Greek. Being Greek myself and a hummus addict I would love to claim that too, but the truth is that even though hummus is served in many restaurants in Greece and is reminiscent of Mediterranean dips, I couldn’t be sure about its origin. The fact is, that because hummus has been around for so long, and in so many different variations, the exact origin may be difficult to track. One very similar dip to hummus that originates from Greece is actually fava dip (click for recipe) from the island of Santorini. That being said, the one fact that is indisputable is that hummus is delicious and the rest is history. So instead of fighting over the origin of the authentic hummus recipe, lets get started preparing your own homemade hummus with this super easy hummus recipe! And while you are at it, might as well start preparing some warm pita breads (click for recipe)! To prepare this easy homemade hummus recipe, all you really have to do is put all the ingredients into a steel blade food processor and pulse until smooth and creamy. When making a homemade hummus recipe, what really makes a difference is the order that you add the ingredients. For this hummus recipe, start by adding the tahini and lemon juice in a food processor or blender and pulse for about 1 minute, until thick and light in colour. Then the chickpeas go in. Process the mixture, until the chickpeas are minced. Lots of hummus recipes require to remove the skins from the chickpeas. Although this is not difficult it will certainly take some more time, but the truth is, having tested both ways, I am not sure that it is worth the trouble. If you have the time try it for yourself by gently pinching the chickpeas until the skin comes off. Add the minced garlic and pour in the olive oil a little bit at a time, whilst pulsing, like making mayonnaise. Blend until the oil is incorporated and the hummus mixture is smooth or coarsely pureed, depending on your preference. eason with salt and cumin and pour in 1-2 tbsps water, if the hummus is too thick. Pulse for 1 more minute. Done! Don’t forget to have a taste and adjust the seasoning to your liking. Remember that once the ingredients are in they can’t get out, so it’s best to adjust seasonings at the end. If you have an aversion to garlic, start using half the amount this hummus recipe calls for, have a taste and add some more at the end. To make this homemade hummus recipe you will need the same ingredients as in the basic easy hummus recipe, but this time you will use homemade tahini, which you made from scratch (click for recipe)! To prepare this homemade hummus recipe with homemade tahini, start by making the tahini paste. You can either use the sesame seeds raw or roasted. Roasting the sesame seeds will make them easier to grind and your tahini will have better texture. But if you have a really good food processor use them raw as tahini made from raw sesame is lower in fat. Place the sesame seeds on a large baking tray and roast them for about 5 minutes, until fragrant and glossy. Sesame seeds can burn very quickly, so make sure to shake them frequently and be careful not to brown them. Place the sesame seeds in a food processor (fitted with a metal blade) and pour in the vegetable oil. Process for about 5 minutes until you have a smooth tahini paste. Don’t forget to pulse for about 1 minute, scrape the seeds from the sides, pulse again and repeat until smooth. Add a little bit more oil if necessary to bring the paste to a thick pouring consistency. Continue preparing the hummus according to the basic recipe instructions. 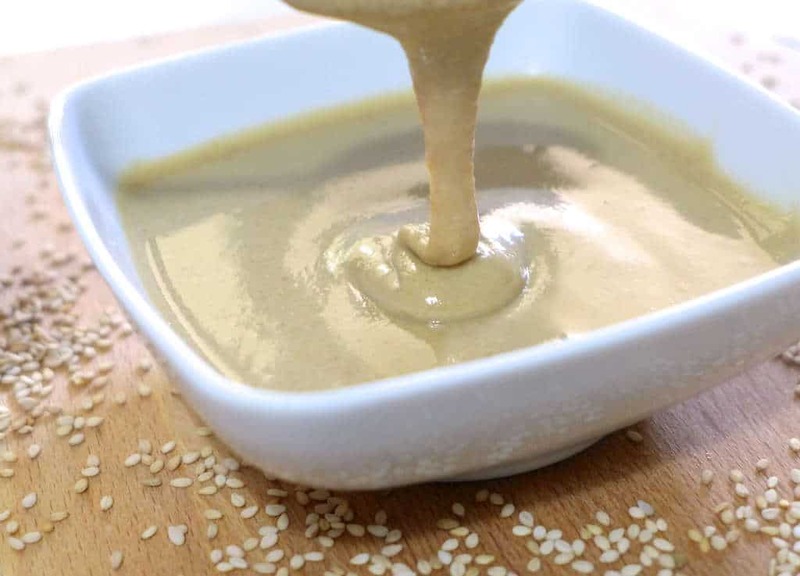 The best part with tahini paste is that it can be stored for several months, so store the rest in an air tight container in the refrigerator and have it ready for next time! Hummus is most commonly prepared using tahini, but if you don’t like tahini or if you don’t have any lying around, then this recipe is for you. To prepare this version of homemade hummus recipe without tahini, place the garlic in a food processor and mince. Add the chickpeas and lemon juice and pulse until the chickpeas are minced. Pour in the olive oil a little bit at a time, whilst pulsing, like making mayonnaise. Blend until the oil is incorporated and the hummus mixture is smooth or coarsely pureed, depending on your preference. Season with salt and cumin and pour in the water, whilst mixing. Add the water gradually and check the texture of the hummus. If your hummus is creamy and liquid enough for your taste, don’t use all the water. Check the seasonings and adjust as you like. Enjoy! So go ahead, give this delicious homemade hummus recipe a try and be surprised with how easy making your homemade hummus really is! great recipes , love how easy tahini sauce is to make and its delicious. In the recipe for the hummus without tahini how much in grams for fresh chickpeas…it states 1 can is that a 14oz one? Very good, thank you for the recipe. I tripled it for a dinner party! For variety, sometimes I will add roasted red pepper. Beautiful color and nice flavor!